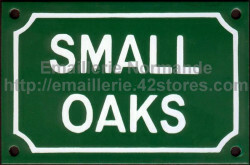 Traditional french enamel steel sign, size 10x15cm or 10x18cm (approx.). 4 holes to screw it on. Fill the form to order your own door number signe or buy a gift for your friends ! Custumise your own little French enamel sign. Fill the form in with the name or short text you would like to create. This typical French enamel street plate may be either blue, green or black. At first, a model will be sent to you to be accepted.